minigopher17: Is there a suggested VDSL modem if selected on the trial? We've had a few people using the Draytek 130. Seems to work pretty well out of the box. We'd actually like people to try out a few different modems and let us know how they get on so we can build a 'whitelist' of modems that we know work well. Thanks, will check them out. I posted on another BigPipe forum about static IPs but hadn't heard... will you be supplying static IPs (or at least give an option to have one) for the trial? sorry, must have missed that question. No static IPs for the trial, sorry. What we do when we launch depends on a bunch of stuff around IPv4 availability, CG NAT experiences, IPv6 etc etc. Zyxel vdsl routers seem pretty solid. Their adsl ones, not so much. infused: Zyxel vdsl routers seem pretty solid. Yeah, I have heard good things about them. Not sure we have anybody using one (that we know of) on BigPipe just yet. I'm using the Telecom VDSL one right now. TG589vn V2. Hi @bigpipenz, just wondering if anymore invites coming or is that it for the year? Update - Got my VIP invite yesterday, getting connected tomorrow afternoon! so fast! :). I also would like to know if there are any more invites? nitrotech: Hi @bigpipenz, just wondering if anymore invites coming or is that it for the year? Almost certainly no more invites going out until Jan. We have support staff on over the xmas break, but would rather not have provisioning screw ups to deal with. Once people actually get connected there isn't a whole lot that goes wrong, so we're playing it fairly safe. If you PM me in the new year (we are coming back on the 7th) with your real name I can take a look at the queue and see how far down you are to give you an idea of if/when you might get an invite. mysticnz: Update - Got my VIP invite yesterday, getting connected tomorrow afternoon! so fast! :). In our user testing we have found a lot of people expect it to take weeks to get a connection, but so far for us, between the time they fill in the sign-up form to actually getting a real connection, we have found it is almost never longer than 2-3 days. In some cases, where it is a simple transition from one UBA to another, it can happen the same day (we've had at least 2 people this has happened with - they got connected before we even had a chance to tell them when it would happen). There will always be the odd 'unusual' one which can take longer, but they are the exception so far rather than the rule. I guess it is probably easier for us compared to most ISPs as we don't have any voice porting weirdness to worry about, no credit checks, no messing around on old systems etc, so we can place the order as soon as it comes in. ouch. That's unfortunate. sorry about that. PM your real name and I'll see if we can get you through today. No promises, but if the cards fall the right way it might be possible. Do you mean you are porting your landline to 2Degrees Mobile, i.e. not to a 2Degrees sim? i'm porting my existing number that is on a telecom homeline over to an existing 2deg pay monthly mobile connection. cost $20/mth or if you're on one of the larger plans then its free. it means everyone can call us (well, my wife ;)) and still pay landline rates and it doesn't cost us any extra - in fact it reduces our landline costs. Thanks, I hadnt seen that. 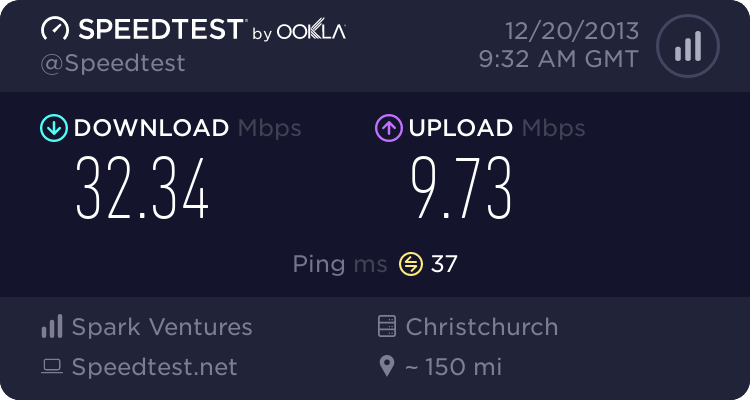 This is a HUGE improvement from ADSL! Had some issues to start with not getting connected but the support guy Michael was awesome and got it sorted quick! Very happy so far will keep you guys posted as the days go by, how do I find out what DLM im currently on? Definitely VoIP (and free calls to the bigger countries) is important, although there are lots of VoIP providers who will let you resell their network. Would be interested in a trial but really need to remove any risk of exceeding data caps etc.